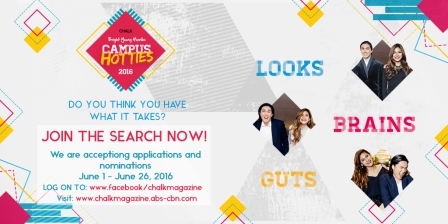 Chalk Magazine is once again on the lookout for the next batch of Bright Young Manila Campus Hotties as it opens the online applications and nominations from June 1 until June 26, 2016. Coming from the success of the 2015 campaign, Chalk Magazine aims to push Bright Young Manila Campus Hotties further by going bigger, brighter, and better. For its 16th anniversary, the annual rundown of today’s talented college individuals will comprise of more challenges to create more opportunities for college students to bring out their potential and hone their talents. Starting off from the online applications and nominations, the editorial team will select the top 30 individuals for live screening before it selects the top 16 finalists. The chosen 16 individuals will then participate in a weekend bootcamp before their reveal at the Chalk BYM Launch Party to happen in July. The online voting will be launched on the same night. For the past years, Chalk’s Bright Young Manila campaign has become a status symbol among the youth. With its thrust to support and inspire young Filipinos, the campaign has committed to help individuals realize their talents and pursue their passions. The annual search has since produced the brightest young talents who have begun chasing their dreams in various industries including music, fashion, theater, and entrepreneurship among others. Bright Young Manila Campus Hotties is Chalk Magazine’s annual search for the metro’s standout students, 18 to 23 years old, who possess the complete package of looks, brains, and guts. One (1) boy and one (1) girl will be chosen as the ultimate #ChalkBYMCampusHotties and will be featured on the false cover of Chalk’s October-November 2016 issue. The BYM campaign aims to be the implementation of Chalk Magazine’s thrust: to look good, love hard, and live young. Since 2006, Chalk has been honoring exceptional college students who conquer campus life and beyond. Think you or someone you know fits the bill? Become one of this year’s batch of #BYMCampusHotties! Simply log on to htttp://chalkmagazine.abs-cbn.com and fill out the required details to join.